Why can't I see my transactions on Blockchain.com? I've a Bitcoin address on which I made a couple of transactions. From what I understand of the blockchain, the ledger is public and anyone can list the transactions linked to a particular address. If so, why do I see zero transaction when keying my address 39QUZnHVbtXGreq3zndkPtrg1TSho2Mbht on https://www.blockchain.com ? My assumption would be that this is due to the way coinbase handles deposits. You can tell more of the story by grabbing the transaction details from their website. Click on the transaction in the Accounts section and look for the "View transaction" link and it will take you to it. Not the answer you're looking for? Browse other questions tagged coinbase.com blockexplorer or ask your own question. Does anyone have insight into how Coinbase calculates the number of confirmations for a transaction? 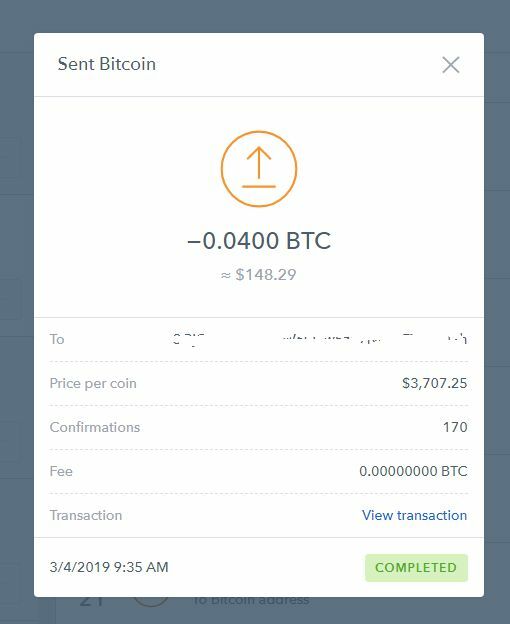 Is Coinbase.com combining / commingling transactions or funds? Is there a blockexplorer with a websocket API that includes relay IP address? Which block explorer indexes the keys used in mutisig scripts?